The Appraiser Qualifications Board’s (AQB) meeting location rotates around the country. This is a rare opportunity to attend an AQB meeting here in our home state. Historically, the AQB has accepted comments from audience members who ask to speak. The Appraiser Qualification Criteria and what a trainee needs to do to become a certified appraiser will make for very interesting discussion. 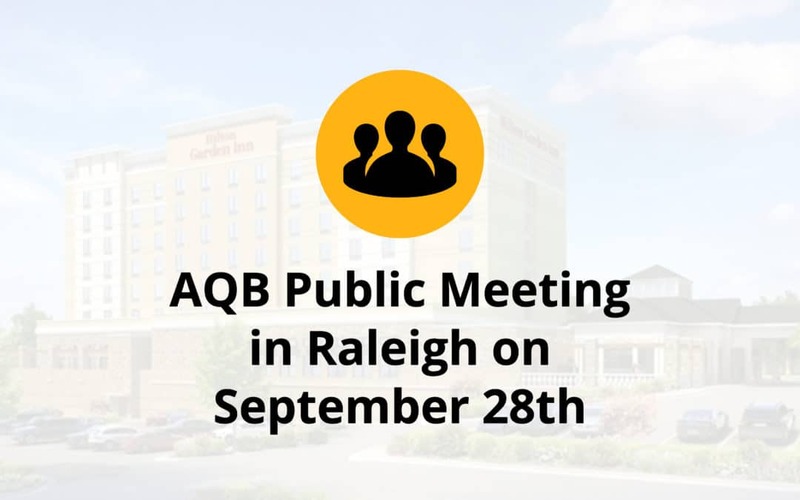 The Appraiser Qualifications Board (AQB) will hold a Public Meeting in Raleigh, North Carolina on Friday, September 28, 2018, from 9:00 am – 12:00 pm EDT. The meeting will focus on implementation issues related to the Real Property Appraiser Qualification Criteria that became effective May 1, 2018, as well as further discussion of the Practical Applications of Real Estate Appraisal (PAREA) concept. The meeting will also be live streamed for those who are unable to attend in person. Learn more about this meeting and register to attend the online live stream by visiting the event page on The Appraisal Foundation’s website.